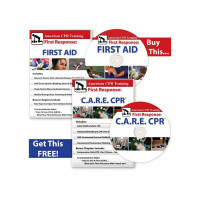 Approved by American CPR Training / American Environmental Health and Safety, First Response: The First Aid Video is a complete 65 min. video of various emergencies that may arise at home, work, or play. This video provides the viewer with basic knowledge and skills required to recognize and treat injuries and illnesses such as asthma attacks, severe allergic reactions, bleeding, shock, head & spinal injuries, bone, muscle & joint injuries, and soft tissue injuries such as cuts, bruises, burns and frostbite. 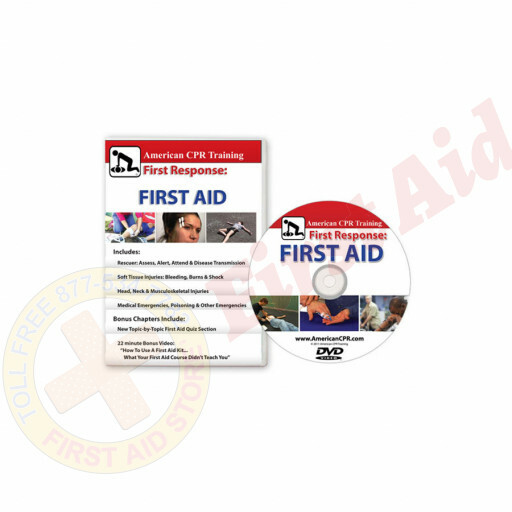 Other topics include diabetic emergencies, seizures, poisons, as well as heat stroke and hypothermia. NEW VERSION - MORE INFO - BONUS CHAPTERS - NEW FOOTAGE & NEW GRAPHICS! The American CPR Training™ / AEHS First Response: The First Aid Video, English (DVD).